Americans take a lot of flak — some of it deserved — for their misperceptions about public policy, global affairs and other matters outside the average person’s everyday experience. But when it comes to assessing the U.S. economy’s recovery from the Great Recession, their perceptions are pretty much on the mark. The stock market was clearly seen as having benefited the most from the recovery: 21% of people said stocks have fully recovered and 53% said they’ve partially recovered. In fact, the benchmark S&P 500 index stands about 35% higher than it did five years ago, and has been consistently above its pre-crash high since the spring. 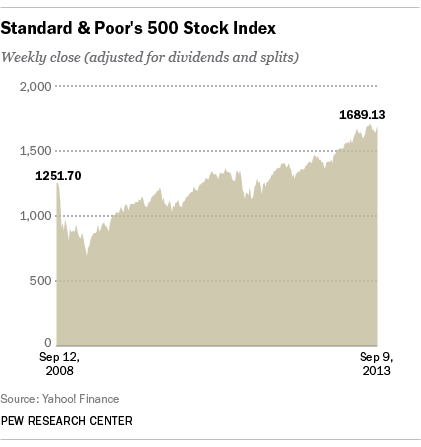 However, as a Pew Research report from April noted, the runup in stocks mainly benefits the already rich: While 59% of households with a net worth of at least $500,000 directly own stocks or mutual fund shares, only 13% of lower net worth households do; wealthier households also are much more likely to own 401(k)-type retirement accounts. Nearly six-in-ten (59%) of respondents said real-estate values have partially recovered from the recession, while a third said they’ve hardly recovered. 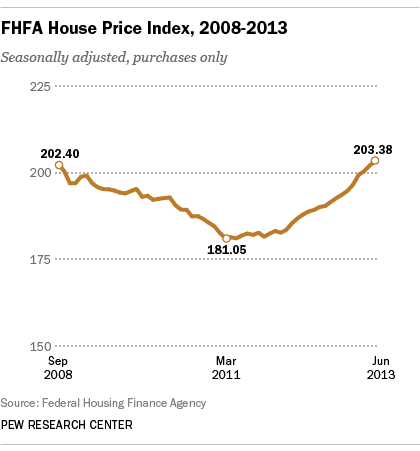 The Federal Housing Finance Agency’s U.S. house price index (which has broader coverage than the more widely cited Case-Shiller index) is up a seasonally adjusted 11.3% since January 2012. But the index is still 10.5% below the heights it reached in the spring of 2007. People are more pessimistic about jobs and income, and with good reason. Fully 45% of respondents said the job situation has only partially recovered, and 52% said it’s hardly recovered at all. While the unemployment rate has declined steadily for nearly four years, that’s due in no small part to people simply leaving the labor force — taking early retirement, going back to graduate school, or simply giving up looking for work. 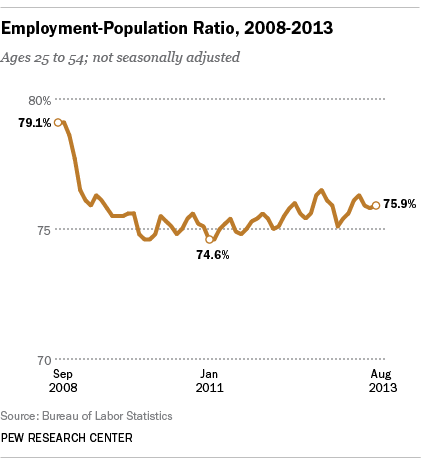 The employment-population ratio, which compares people with jobs to the entire working-age population, is up only slightly since its early-2011 low. (The chart shows the ratio for people ages 25 to 54, to minimize the impact of students and retirees). 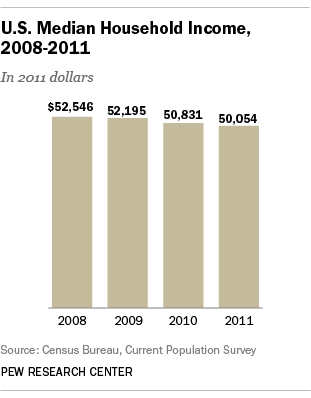 As for median household income, the most recent data we have is for 2011 (the Census Bureau will release 2012 numbers next week), but they show that after factoring in inflation, the median U.S. household income shrank 4.7 percent between 2008 and 2011. Little surprise, then, that more than half (54%) of the people in our survey said household incomes have hardly recovered since the recession, and a scant 2% said they’ve fully recovered.